"It is better to do something imperfectly than to do nothing flawlessly"
Campmor is an outdoor recreation equipment retailer established in Bogota, New Jersey in 1978 by Morton Jarashow. Known for its wide selection of outdoor clothing, camping, backpacking, bicycling and water sports equipment, Campmor derives more than 80% of its sales from its website, http://www.campmor.com/. Campmor is unique within its industry for its retail service model, which places particular emphasis on employee knowledge rather than on employee versatility, where the person you may be talking to about your purchase will be an avid user of that product. That makes a big difference. I CAN MOST WHOLE HEARTEDLY RECOMMEND CAMPMOR! I CAN ALSO RECOMMEND EUREKA TENTS! I cannot remember when I did not camp out, starting with bare-bones camping as a very young child alongside the Ohio River, a blanket and a skillet comprising my camping gear, maybe a tarp of some kind. I still enjoy this type of adventure and made a trip down river in a canoe in that manner once since I've been retired. I made my first tent camping trip in 1959. I recall the year specifically as I had just bought my first new car, a 1959 Chevy. That trip was made with friends, Jeral and Pebble Davis, through the Smoky Mountain National Park, returning by way of Mamouth Cave. On that trip I learned about bears. I would learn more about bears as the years rolled by. Un Huh! I now own two Eureka tents, a 4# back packing model, seem above on a cyclling trip,and a 6 Person Family Tent, a bit worse for wear. I am now buying the EUREKA TIMBERLINE OUTFITTER 4 tent shown on the left. The OUTFITTER SERIES is made more rugged for constant use over a long period of time. I am planning a cross country camping trip through the western National Parks this spring. Next year I am planning a camping trip to Alaska. Designed to sleep four on the floor, it will comfortablely sleep two in cots, which I plan to use. Camping alone, I'll be able to set up a chair inside. Always a real blessing, having a chair inside is almost a necessity with reduced mobility. My eldest son, Mark, owns this tent. I borrowed it in 1989 for a wilderness canoe trip with my brother, Henry. I have wanted to own this tent every since. 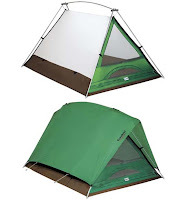 I need to buy it now as it looks like EUREKA is going to discontinue this exact tent for an improved model of the same tent. I prefer the older, familiar tent. It is on sale at the moment for $50 off, a good deal. On that trip, my brother and I certainly gave the tent's stability a good work out. It stood up to the test. A tornado went through the forest blowing down trees all around us. The temperature suddenly dropped about 20 degrees with hail falling, the oft described train sound started as the wind started to fell the trees. The rain was a torrent. That little tent swayed, at times nearly collasping upon us. We moved the cots together to get away from the sides of the tent. It kept us warm and dry, all you can ask of a tent. with millions sold over the years. I am pleased to own another one. Do you camp? It may or may not be for you. My middle, and most rambunctious child, Todd, and his wife, Amy, cycling enthusiasts, camp out several times yearly, pictured left. Todd is now recovering from frost bitten toes from riding his bike in sub freezing weather. My daughter, Kimberly, who did a lot of family camping as a child, has arrived at the conclusion that anything less than a 4 star hotel is a hardship. All that being said, once camping equipment is acquired, and I have it all, you can live out-of-doors in relative comfort for next to nothing. This now makes cross country trips a possibility on retirement income as it once did as a young family man starting out in life. AND, I LIKE TO CAMP! "WE TURN NOT OLDER WITH YEARS BUT NEWER EACH DAY"